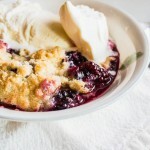 Fresh, sweet berries and a beautiful golden butter crust-this cobbler is the perfect dessert for summer! Pre-heat oven to 350 degrees. In a large bowl, combine 1 cup sugar, flour, salt, baking powder and 2 tsp of cinnamon. Cut in the cold butter with a pastry blender until the mixture resembles wet sand. Mix the beaten egg into the flour mixture until the egg is evenly distributed. Pour the berries into an 11×13 baking dish and stir in the remaining sugar and tapioca pearls. Sprinkle the cinnamon and nutmeg over the top of the berries. crumble the cobbler dough over the berries until the dough covers almost all of the berries. Bake in the pre-heated oven for 40 minutes or until the berries start to bubble and the crust gets golden brown. If you find that the crust isn’t browning-turn the broiler on and broil the cobbler for a few minutes only-careful to watch it and make sure it doesn’t burn.